Looking for cryptocurrency brokers? We have compared 12 broker accounts (out of 147) that are suitable for you below. We found 12 broker accounts (out of 147) that are suitable for trading cryptos. The word “Cryptocurrency” is thrown around a lot these days, but what is it really? Some say it’s the greatest technological breakthrough of our time, while some say it’s the biggest scam of our time. But few people can actually explain what it is. In this article, we help shed light on the topic of cryptocurrencies. Cryptocurrencies are digital or virtual currencies that use cryptography to secure and verify transactions so that they work as a medium of exchange. Cryptography is also used to control the number of units and prevent changes to the Cryptocurrency’s code unless certain conditions are fulfilled. As well, cryptocurrencies have three characteristics that they all share in common. They are trustless. Meaning no third party is involved by replacing trust verification with a peer to peer network. Individuals can directly send cryptocurrencies to one another without permission or control from corporate institutions or governments. They are immutable. Cryptocurrency transactions cannot be undone, reversed, double spent, or altered. Therefore, Cryptocurrencies are far more transparent and effective than traditional fiat currencies. They are decentralized. A Cryptocurrency is controlled via its distributed ledger technology, known as the blockchain. The creation of new units is coded into the system and no one entity controls it. Blockchain is the underlying technology of Bitcoin and most other cryptocurrencies. In its essence, it is a growing list of recorded data, called blocks, which are linked together using cryptography. All of the recorded data is referred to as a “ledger”, and every time there is a data exchange, a “transaction”, a new block is added to the ledger or “blockchain”. Therefore, the blockchain or ledger can have information added onto it, but it is always added on in the form of a new block. Previous blocks in the blockchain can never be changed, edited, or adjusted. Another important aspect of blockchain is that they are consensus driven. Meaning a large number of computers in a distributed system are needed to verify each transaction. This is also known as a peer-to-peer network of nodes. Cryptocurrency mining is a process in which miners use powerful computers and hard drives to solve complicated mathematical problems. These mathematical problems have cryptographic hash functions which are associated with a block containing transactional data. While solving these problems, the miner is competing against other cryptocurrency miners and the first one to solve the mathematical problem is rewarded with small amounts of cryptocurrency. The reward is too incentivise miners to continue mining and thus securing the network. The mining award comes from the transaction fees users pay as well as newly released crypto. A cryptocurrency wallet is a digital wallet used to store, send, and receive cryptocurrency. A big misconception of crypto wallets is that the cryptocurrency is stored within the wallet’s software or hardware. However, this is not the case. Crypto wallets simply store a cryptocurrency’s public and private keys, while the crypto itself remains on the blockchain. So essentially, a crypto wallet stores the information in which gives you access to your crypto assets. There are 3 different types of cryptocurrency wallets you can use. Another secure wallet but quite inconvenient is a paper wallet. An ICO (initial coin offering) is a method of fundraising that new Cryptocurrency projects use to build start-up capital. They work by selling their underlying crypto tokens in exchange for Bitcoin or Ethereum. Investors buy these crypto tokens during the projects ICO if they think the project will succeed. An ICO is similar to an IPO (initial public offering) in which investors purchase shares of a company when they go public. Both ICOs and IPOs allow investors to get in at an early stage and make a profit if the company succeeds. The biggest difference between an ICO and an IPO is that anyone from anywhere in the world can participate in an ICO. This has led to an explosion of ICOs with over $6 billion being raised in 2017 and over $7 billion so far in 2018. The term “token” has taken on a few different meanings in the cryptocurrency space. Tokens are a kind of cryptocurrency that represent an asset or a utility. While cryptocurrencies are primarily used as a means of exchange like a currency, crypto tokens actually represent a specific asset or are actually meant to be used for something. The topic of crypto tokens is a deep one, but we will give some examples here. A crypto token can be used as customer loyalty points in which they can be redeemed to receive a discount on a product, or even used to pay for the product. A crypto token can be used to represent something. For instance, a token could be used to represent 5 bitcoins per token. A crypto token might be used in order to watch a video on a tokenised video streaming service. The examples go on and on and they are always up for debate as the concept of crypto tokens is still very new. A smart contract is a self executing contract that’s built using a computer protocol running on top of a blockchain. The contract itself is built into the code along with the terms of the agreement between two parties. The smart contract code can facilitate, verify, and enforce the terms of an agreement or transaction. Essentially, smart contracts are the simplest form of decentralised automation. The idea behind smart contracts is to provide a superior contract to traditional contract law by increasing security and lowering expenses involved in a contract. Smart contracts can facilitate trusted transactions and agreements between dishonest and anonymous parties without the need for external enforcement such as legal systems, central authorities, etc. A cryptocurrency exchange is a business that allows customers to buy, sell, or trade cryptocurrencies. Some exchanges only allow crypto to crypto trading while others allow crypto to fiat and vise versa. 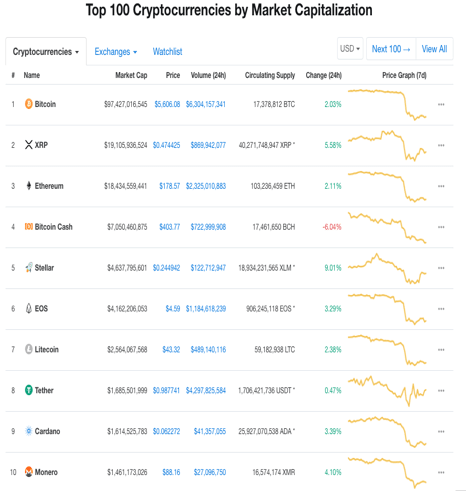 The largest and most popular crypto exchange in the world in terms of daily trading volume is the Binance exchange. Binance only facilitates crypto to crypto trading with no support for fiat currencies. Traders on Binance can trade various cryptos against Bitcoin (BTC), Ethereum (ETH), Binance Coin (BNB), or Tether (USDT). Another popular exchange is Coinbase. Coinbase differs from Binance because they accept the on and off boarding of fiat currencies. Currently, users can trade Bitcoin (BTC), Bitcoin Cash (BCH), Ethereum (ETH), Ethereum Classic (ETC), Litecoin (LTC), 0x (ZRX) and Basic Attention Token (BAT). Coinbase has plans to add hundreds if not thousands more cryptocurrencies in the near future. The fiat currencies accepted at Coinbase include USD, EUR, and GBP. A cryptocurrency exchange that differs from the ones already mentioned is LocalBitcoins. This exchange facilities over-the-counter trading of local currency for Bitcoin. Users post their Bitcoin for sale on the website along with their exchange rate and payment methods. Cryptocurrency is the most volatile asset class of our time. It’s not uncommon to see price swings 50%+ in any direction within a given day. The volatility is largely due to the highly speculative market of cryptocurrencies. As well, cryptocurrencies do not follow any regulatory oversight, have thin order books, lack institutional capital, and currently have no intrinsic value. To give an example of the volatility apparent in cryptos, look at the graph below of the most popular cryptocurrency, Bitcoin. As you can see in the price chart above, the price of Bitcoin went from $6300 in November to $20,000 in December. That’s a price rise of over 68% in the span of a month, and at the of this writing, roughly 10 months from its high, the price is back to where it was a year ago. An example of a crypto that went to zero and is no longer available is Bitconnect. 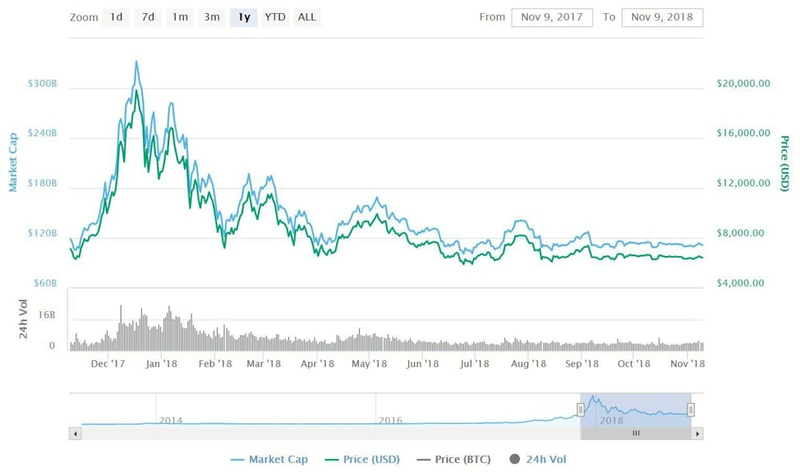 As you can see in the chart above, when people finally realized Bitconnect was a Ponzi scheme, it dropped from a price of over $400 to 0 in a matter of days. Therefore, it is important to understand the project you buy into as there are many scams in crypto with false promises. The top cryptocurrencies for traders are generally the ones with the highest market cap. For example, several brokers regulated by the Financial Conduct Authority in the UK like City Index, IG, eToro and XTB all offer the cryptocurrencies Bitcoin, Bitcoin Cash, Ethereum, Ripple and Lite coin for traders. 1. 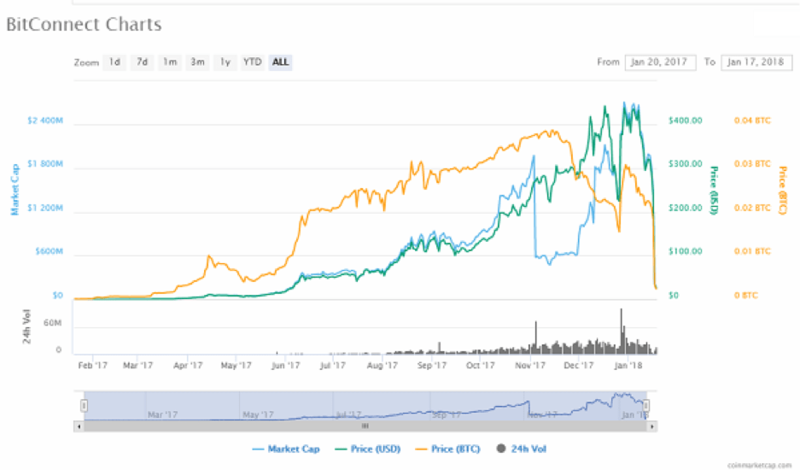 Bitcoin (BTC) is by far the most popular cryptocurrency for traders as it has the largest market cap, was the first successful cryptocurrency, is available on nearly every exchange, and has the most liquidity. 2. Ripple (XRP), known for its relationship with the banking industry and speculation for potential. 3. Ethereum (ETH). A popular cryptocurrency that is widely available across exchanges, and it is also highly speculative. 4. Bitcoin Cash (BCH), Bitcoin Cash was created to all an increase the block size to 32MB from the original bitcoin in an attempt to improve the usability of the cryptocurrency. 5. Litecoin (LTC), is a cryptocurrency that provides instant and low-cost payments globally. When trading cryptocurrencies on an exchange, the trader is actually buying and selling the crypto asset. When a trader places a buy order and it’s fulfilled, they actually gain possession of the crypto asset and can send it to their personal wallet, spend it, transact it, etc. When trading cryptocurrencies by using contracts for difference (CFDs), the trader is simply speculating on the price movements. They do not actually buy or sell the crypto asset itself, but rather a contract on the price of the crypto asset. For example, when trading with XBT, a CFD broker, buying 1 bitcoin would require the nominal value of 1 lot with 1:2 (50%) leverage. Essentially, the trader only has to put down a fraction of what 1 bitcoin costs in order to speculate on its price. While buying 1 bitcoin on a cryptocurrency exchange, they would require the full price amount of 1 bitcoin, say $6500. Upon buying this bitcoin, it will be transferred to the trader’s exchange wallet. The trader can then choose to trade it again or send it to their own personal wallet. Also, if the price of Bitcoin went up 10% when trading a Bitcoin CFD on leverage, the trader would receive a larger profit on their money than a trader who actually bought the Bitcoin on an exchange. However, the same is true if the price of Bitcoin drops 10%, the CFD trader can lose more money than the exchange trader because they are using leverage to trade. Currently, the FCA does not have any regulatory scope over cryptocurrencies in the UK. However, they are keeping a close eye on things and trying to figure out how to regulate cryptocurrency in the near future. Currently, cryptocurrencies are legally allowed to be traded in the UK and it seems as though they will continue to be allowed in the future. There’s no question though, that FCA cryptocurrency regulation in the UK is on the cards for the near future.